There is a great deal if interest in the whereabouts of the grave of Mary Stockum, since a legend has grown up around the circumstances of Mary Stockum's life, death, and the treatment of her remains. Historically this legend has remained pretty much in Coshocton County, but the Internet has given the legend some degree of wider recognition, at least within the "ghost hunting" community. The legend centers around allegations that Mary Stockum was involved in witchcraft, which resulted in tragic misfortune. Legend says she was executed. But visitors should be made aware that there are no authoritative records to substantiate any of that legend. There are plenty of websites that promote the legend, which you can of course search online for. Here is a good example. This page is intended to help locate the Stockum Cemetery, not to present images of grave markers. There are a few extellent websites that already to that. There are dozens of images available at this site. Whatever legend might have grown-up around Mary Stockum's memory, Mary Stockum herself is not a legend. Without question, a grave marker exists for Anna Mary Stockum in the Stockum Cemetery, who evidently died in 1863. Anna Mary Stockum is purportedly the Mary Stockum of legend. She even has a findagrave.com page. The Stockum Cemetery, where Mary Stockum's grave can be found, primarily draws teenagers. They visit the abandoned cemetery, mostly at night, in hopes of having a paranormal experience. More often that not visits to the cemetery involve alcohol, as evidenced by empty beer cans & wine bottles scattered about the area. 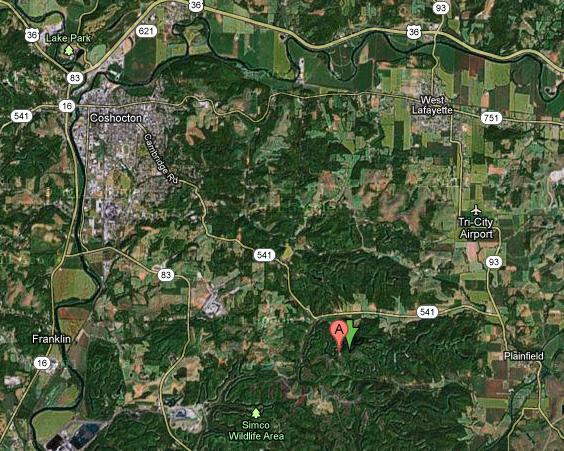 Having grown-up in Coshocton, I happen to be aware of the precise location of the cemetery. Yes, I had a few beers at the Stockum Cemetery myself. I can't say I witnessed any paranormal events, but I always had a good time. All of the websites I've visited that attempt to provide directions are incomplete, vague, or just plain wrong. Rather than allow paranormal experience seekers to be completely misled, I created this page. With the help of the images below you will be able to navigate directly to the Stockum Cemetery. The basic location of Stockum Cemetery is approximately 5 to 6 miles southeast of Coshocton on route 541 (a.k.a. Cambridge Road, in Coshocton). As you can see by the map below, the general location of the Stockum Cemetery, marked by the green arrow to the right of the red "A" marker, is roughly half way between Coshocton and Plainfield. Start by driving southeast out of Coshocton on Cambridge Road. 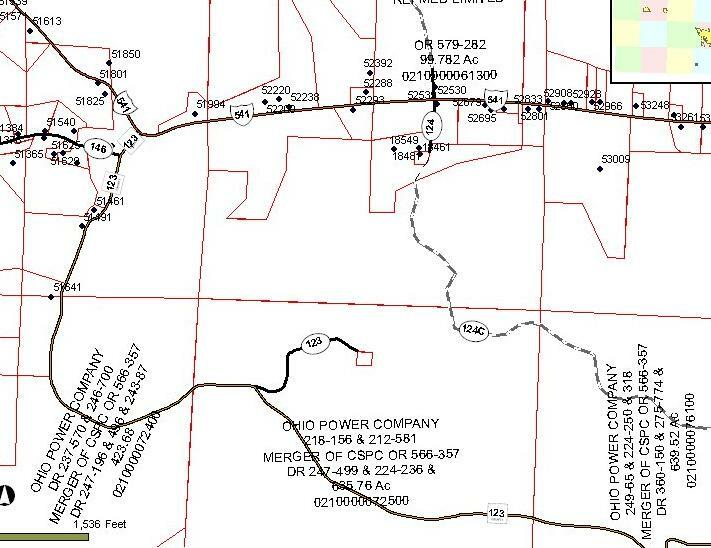 Follow highway 541 for 5 or 6 miles from the SE edge of Coshocton until you see County Road 123 on the right. County Road 123 is marked with a green street sign. Some instructions I've seen around the Internet say to look for the next road to the right, perhaps 500 feet east of County Road 123 and marked "Haul Road", but the Haul Road goes to the same place County Road 123 goes. The only reason to use the Haul Road is in the even that there are road condition issues on County Road 123. To illustrate what I'm talking about, consider this map image. IMPORTANT NOTE: The cemetery is marked on the above image with the green arrow, not the red "A" marker. The red A marker is only intended to label the road. 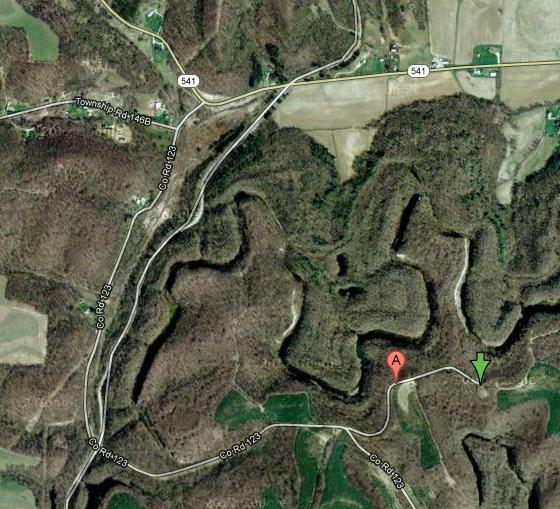 As you can see, County Road 123 and the Haul Road intersect near the bottom left of the above image. Clearly, County Road 123 is a perfectly good route to the Stockum Cemetery. After the intersection, continue east on County Road 123 for about 1/2 mile to where the road forks. Take the left fork, which is unmarked but apparently named Township Road 123. Drive on that road for about 1/4 mile until you come to the clearing highlighted in the image above with the green arrow. If the road is not in good condition you may need to walk part of the way. The image below shows a close-up of the cemetery clearing. You can see white objects in that clearing on both sides of the road, which are white marble grave markers. If you have a GPS device with you then you can confirm the location by latitude & longitude. 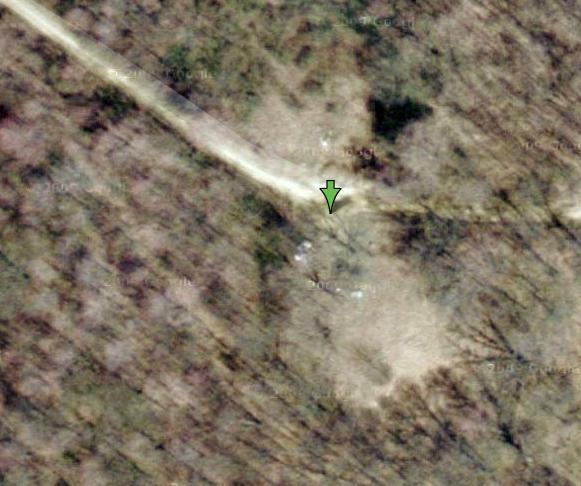 The green arrow should indicate GPS coordinates of 40.21032 and -81.77960, plus or minus 30 feet or so. Armed with that information, it should be easy to locate the Stockum Cemetery. Which cemetery is it, and who owns & administrates it? Most often, people refer to this cemetery as the Stockum Cemetery, although I have never seen an authoritative reference calling it that. I've also heard it called the Coshocton County Cemetery, and you will find numerous references to Saint John's Lutheran Cemetery at Google indicating the proper location. I have been told that there was a Lutheran church on the grounds at one time, but I have no authoritative reference to help establish that fact. But I don't know for a fact that any of those names are the official name of the cemetery. Strangely, there seem to be no official records at all for that cemetery. I say strangely because the cemetery was actually used for new burials as late as the 1940s. 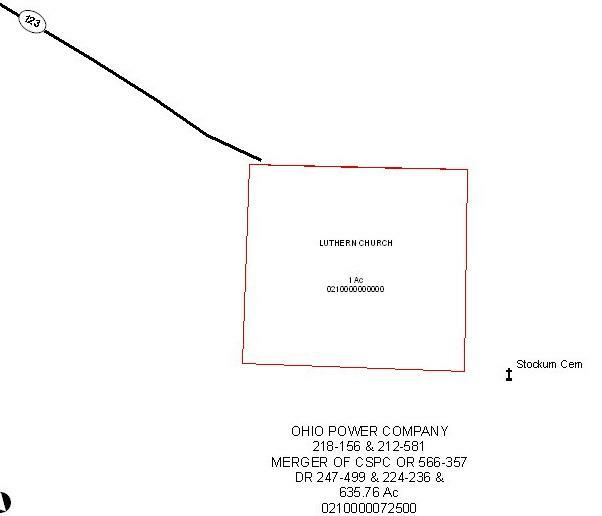 From an inspection of the Coshocton County Assessor's maps, most of that area is now owned by the Ohio Power Company, not surprisingly since the power company was the ultimate consumer of the coal recovered during strip mining operations. However, if you look at the map below you can see a small 1-acre square parcel at the end of Township Road 123, exactly where we expect Stockum Cemetery to be. If we zoom in to that small square parcel we see that it is owned by the Lutheran Church. There are no online records available for that parcel at the Coshocton County Recorder's office website since the property has not changed hands recently, so we have no address or other contact information without contacting the recorder's office in person. Notice also that there is a point-of-interest marker for "Stockum Cem", although it is not placed exactly in the correct location. While not completely authoritative, it demonstrates that someone in the Coshocton County offices believes that the proper name of that cemetery is the Stockum Cemetery. While the Stockum Cemetery is evidently owned by the Lutheran Church, the cemetery is completely unmaintained. As long as you aren't there to vandalize property I think there is little risk of being charged with trespassing. If I were looking for the current owner of the cemetery property I would first consult with the Coshocton County Recorder to obtain contact information about the record owner. A Word of Caution Here -- NO KIDDING! While I believe personal danger from paranormal events is minimal, there is real and present danger in the vicinity of the Stockum Cemetery. You will notice in the above images that the vicinity has an interesting texture to it, and even appears to be undeveloped wilderness rather than the farm country you would expect in rural Ohio. That's because that particular area is the former site of massive strip mining operations, which occurred there in the mid-1960s. In the quest for coal, huge openings were created in the earth to uncover coal deposits. Those openings have never been filled-in and are enormous, often 100 or more feet deep, several hundred feet wide, and sometimes 1/2 mile long or more. To put that into perspective, you could throw every house in a typical residential neighborhood into one of those openings and still not fill it up. The danger is that there are abrupt manmade cliffs that are 50, 75, and even 100 feet or more deep throughout the area. It is therefore necessary to use extreme caution when wandering around that area, particularly at night. If you aren't intimately familiar with the area then you never know if there might be a 100 foot vertical-drop cliff just beyond the next tree. Knowing the foregoing, it's a wonder that the cemetery survived strip mining at all. If a vein of coal happened to run beneath the cemetery then it would have undoubtedly been lost to history forever. Even though grave markers indicate that the cemetery was used as late as the 1940's, that entire region was earmarked for strip mine excavation. Although excavation came to within a few hundred feet of the cemetery, the cemetery escaped destruction. This page is sponsored and hosted by Entomy Networks.